NAHB’s analysis of the most recent Census Bureau’s Survey of Construction (SOC) shows that in 2014 custom home building expanded across all regions of the Unites States, except the Mountain division where the custom home share of new single-family starts remained stable under 16 percent, the lowest share in the nation. 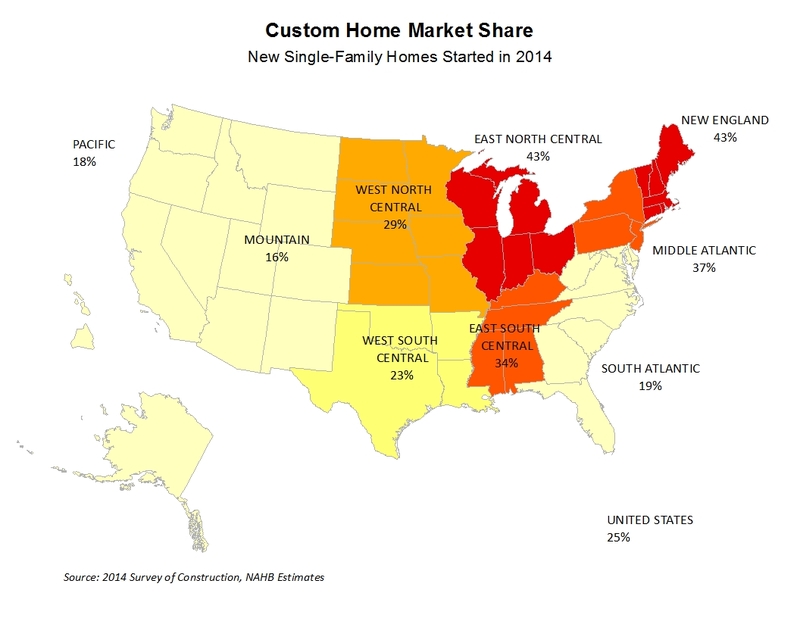 The New England and East North Central divisions registered the highest custom home market shares, close to 43 percent, up from 37 and 39 percent respectively in 2013. The SOC differentiates between houses built for sale, houses built by contractors, owners and for rent. Built for sale, or spec houses, are houses built on builder’s land with the intention of selling the house and land in one transaction. Contractor-built or owner-built houses – that together make up the custom home market – are built for owner occupancy on owner’s land with either the owner or a builder acting as the general contractor. Nationally, the custom home market share exceeded the 2012-2013 levels and reached 25 percent but remained below the 2008-2011 levels when the credit crunch has limited builders’ access to Acquisition, Development, and Construction (AD&C) loans and shifted production towards home building on owner’s land. 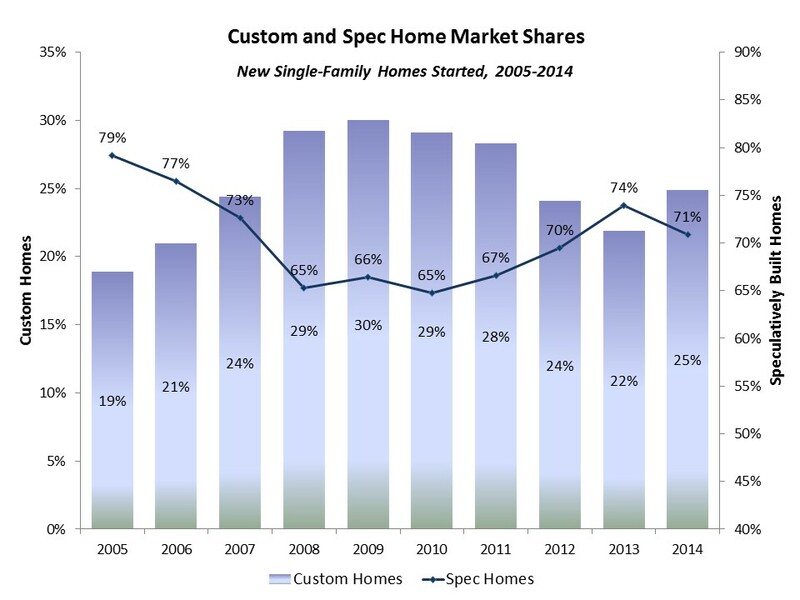 While nationally one in four homes started in 2014 is a custom home, the share varies widely across the US divisions. The New England and East North Central divisions stand out for registering the highest shares of starts supervised by contractors or owners – close to 43 percent. The Middle Atlantic and East South Central divisions register the next highest shares of new homes started on owners’ land – 37 percent in Middle Atlantic and 34 percent in East South Central. At the opposite end of the spectrum are the Western divisions – Mountain and Pacific – and South Atlantic where only 16, 18 and 19 percent of new single-family starts were custom built homes. Home building here is dominated by spec starts. These divisions register the highest three spec home shares – 82 percent in Mountain, 79 percent in South Atlantic, and 78 percent in Pacific. In comparison, in New England and the East North Central division, homes built for sale accounted for just over half of all new single family starts, 51 and 52 percent respectively. The East South Central division stands out for having the highest share of homes started for rent, more than 9 percent, and more than double the national average of 4 percent. The SOC also keeps track whether new homes are started in community or homeowner’s associations, formal legal entities created to maintain common areas and to enforce private deed restrictions. These organizations are usually created when the development is built, and membership is mandatory. Nationally, 58 percent of single-family homes started in 2014 are built in community associations. Most of these homes, more than 90 percent, are homes built for sale, so it is not surprising that shares of speculatively-built homes and homes built in community associations are highly correlated across the United States. The two divisions that report the highest shares of for sale starts – the Mountain and South Atlantic divisions – also report the highest shares of starts in community associations – 77 and 72 percent respectively. And New England simultaneously reports the lowest shares of speculative starts and the lowest shares of new starts in community associations, less than 22 percent. Thank you for sharing this. Hope the trend this year would follow last year’s trend and be higher than what was experienced in the middle of the year.